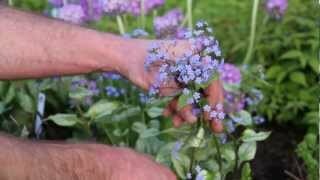 Brunnera, or False Forget Me Not, bloom in early spring. Their foliage varies; one variety called Jack Frost, for example, has silvery patches on its leaves. There are also variegated cream and green varieties, as well as chartreuse varieties. 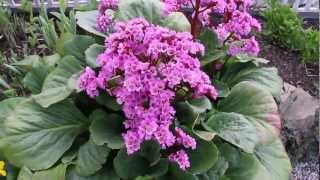 Brunnera will stop blooming in June, but their leaves will continue growing in size.